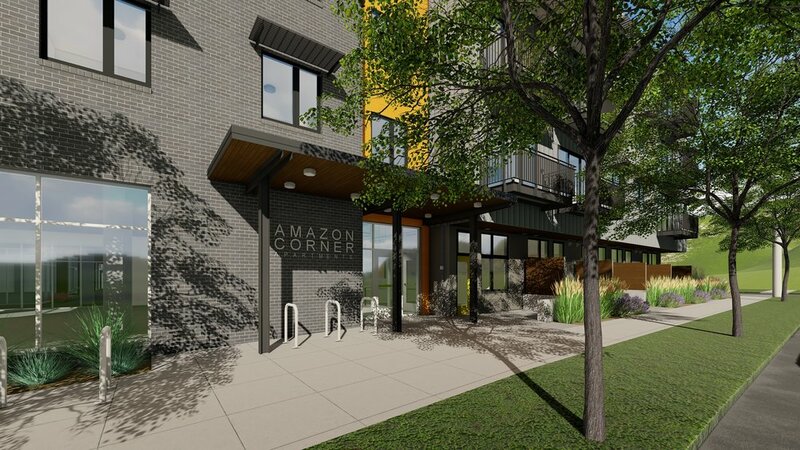 Amazon Corner is a 120,000 sf mixed-use apartment building at 32nd Avenue and Hilyard Street in South Eugene. The building is “four-over-one” with below-grade parking, ground-level retail and residential space, and four floors of residential living above. There are various housing types, from studios to two-bedroom apartments. The developer Mike Coughlin, whose Burley bike trailer company is a well-known local business, is a long-term Eugene resident. An important goal of the project is to create a durable building with high-quality materials. The building has brick and wood cladding with metal panel accents. A southwest-facing plaza with ground-floor retail invites the larger community of Eugene to intermingle with residents and enjoy a lively outdoor space. Retail focus in the plaza will be toward food and beverage providers with restaurant/pub and bakery/coffee shop/deli as desired anchor tenants. Public spaces ancillary to food and beverage retailers include a mix of covered and uncovered outdoor dining areas. Private balconies are provided for most residents and the building exterior form attempts to maximize available views while creating neighborhood attractiveness and an urban vibrancy. From the upper floors, there are views of Spencer Butte. Amazon Corner fits in with community goals of smart growth along transit corridors. Particular attention is given to creating convenient access and welcoming spaces for pedestrians and cyclists, as well as motorists.